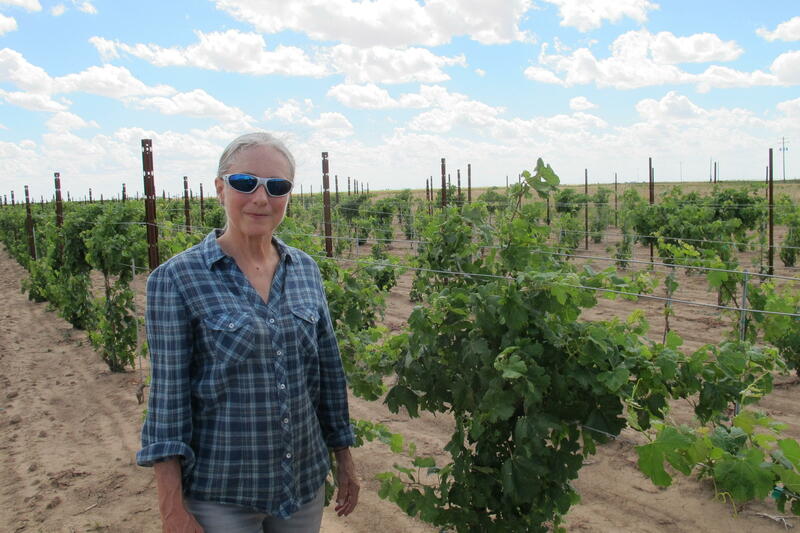 Andis Applewhite's vineyard near Lockney, Texas, has been hit multiple times by herbicide drift. "It's fun," says Applewhite as we stand in her fields. She inspects a vine that is starting to wrap itself around a trellis. "It's looking like a real grape plant." But Applewhite has yet to harvest a crop. Over the past two years, something has caused her vines to twist and wither. And she's not alone. Grapevines in Texas are being damaged by a seemingly invisible force. Livelihoods are at stake. Texas is one of the largest wine-producing states. It has more than 400 wineries. The industry says it boosts the state's economy by some $13 billion annually. The damage at Applewhite's vineyard and elsewhere is likely coming from one of her cotton-growing neighbors. New weedkillers used on the cotton crop are drifting beyond the fields and causing damage elsewhere. When Applewhite first noticed what was happening, she says, "I was really mad. I wanted to kind of lash out." "But then I said, 'No, I really need to get more information, and this is going to be a process.' "
"This cotton has been out of the ground about three weeks, it's 3 weeks old," he says. "Back then, you could farm a smaller amount of land and still make a good living," he says. His favorite was one called Roundup. "The old Roundup, it'd kill any size weed, anytime, anywhere. It was great," he says, smiling nostalgically. This is how Roundup worked: First, he would plant cotton seeds that were genetically modified so the herbicide didn't bother them. Then he could spray the entire field. The weeds would die, and the cotton would thrive. "The first couple of years, when we got hit with that resistance, it was a nightmare. We didn't exactly know what to do," said Smith. "There's a lot more specific information that the applicator needs to be aware of, and those conditions must be followed very carefully," says Peter Dotray, a weed science professor at Texas Tech University and Texas A&M University. Dotray, who sees the new herbicides as important tools for growers, says he personally might be even more cautious than the label requires if there is a sensitive crop nearby. "I'm going to try to manage the risk as best I can, and if I see something close by that is a crop like a vineyard, I'm probably going to try to create an even greater buffer." Cotton grower Dan Smith stresses that he goes to great pains to be careful. "Nobody wants to hurt that vineyard," said Smith. He's using a different kind of herbicide in the area near Applewhite's vineyard, and in other areas, he adds an extra chemical that is supposed to prevent dicamba drift, just to be safe. "It's an expense I don't have to do, but I feel like I better," Smith says. "You can't do it," he says, laughing uproariously. "Your fairy godmother has to pull out a wand, tap the pumpkin and turn it into a carriage." Cox planted his vines more than 30 years ago in an area that is now the heart of the Texas wine grape-growing industry. "Oh, people thought you were flaming nuts," he says, remembering the early days when he was a pioneering grower. The results were devastating. Unlike crops like cotton, which farmers replant each year, it takes years for vines to reach their prime. "It takes so long to make a crop, it sticks with you so long ..." he says, trailing off. "You just lost so much." Some of his vines still look sick. The leaves are really small and fan out in a strange way. He has seen a major reduction in yields. About 20 percent of Cox's vines completely died. As he walks down the long rows, he sighs and reaches down to pull a dry, brown stump out of the ground that can't be saved. The next time he's expecting a full crop is 2020, four years after the damage was done. Many wine growers nearby are also facing drift damage, ranging from light exposure that doesn't impact the fruit, to total devastation like Cox. And this area grows about 80 percent of the wine grapes in Texas. Because there's so much variation in how harmful the damage is, it's hard to say conclusively how many growers have been impacted. Pierre Helwi is a viticulturist for the Texas A&M AgriLife Extension Service. He monitors dozens of vineyards around here and is on the lookout for damage. "And I saw it, I would say in 90, 95 percent of the vineyards there. So it's everywhere." Perry Cervantes, coordinator for pesticide certification and compliance at the Texas Department of Agriculture, said that given the few complaints, tightening the laws on these chemicals would hard to justify. "As big a state as we are, I don't see why we would want to put any more regulation on it if we don't have, you know, proof that we need to." And not all winegrowers agree that more regulation is needed for the new herbicides. Katy Jane Seaton, executive director of the High Plains Winegrowers Association, also grows cotton, like many wine grape growers here. She says she does not believe the chemical itself is responsible — it's about the herbicide's applicators, she says, and the relationships that they have with their neighbors. "It's never the product's fault," she says. "Pencils don't misspell words, guns don't shoot people and the product isn't at fault." After Cox's vines were devastated, the Texas Department of Agriculture fined the neighbor $800 for "using herbicide in a manner inconsistent with the label," according to documents obtained by NPR. Cox is also in the process of working out a settlement with the neighbor. But for other growers, it can be difficult to hold people accountable for the damage because it's sometimes impossible to know where the drift came from. Applewhite, the artist, filed a complaint with the Texas Department of Agriculture in 2016 after her vines were damaged. "Our investigation shows that a violation of Texas pesticide laws may have caused or contributed to the effects or activities which led you to file a complaint," the department says in its closure letter. "We did not, however, find enough evidence to identify the person responsible or to determine that a violation did in fact occur. As a result, the investigation of your complaint has been closed." "I noticed on new growth, the deformed leaves," Applewhite says. The vines were suddenly showing signs of new herbicide drift. And her neighboring farmers say they didn't do it. "You know, they told me they didn't spray. So I have to believe them," she says. This time, she didn't see any point in filing a complaint because she doesn't think it will help the problem. All she can do is keep working on her vines. When you think of wineries, you may conjure up images of the West Coast, Napa Valley or the Willamette Valley in Oregon, although - did you know? - Texas is one of the largest wine-producing states in the country. And as NPR's Merrit Kennedy reports, something is causing vines there to wither and die. MERRIT KENNEDY, BYLINE: On the high plains in West Texas, hot winds blast through cotton fields as far as the eye can see. In the middle of it all is a tiny vineyard. ANDIS APPLEWHITE: Let's go out here, and I'll show you. KENNEDY: Andis Applewhite is an artist, and her family has been working this land for a century. They used to plant crops more typical of this neighborhood, like cotton and wheat. APPLEWHITE: See, these are looking good. KENNEDY: A couple of years ago, she decided to try something different, seeing the success of other local wine grape-growers. Believe it or not, wine in Texas is big business. The industry says it boosts the state's economy by some $13 billion every year, so she planted a couple of acres of cabernet franc grapes. APPLEWHITE: It's fun. It's looking like a real grape plant - grapevine. KENNEDY: This is her third season with these vines, but she hasn't yet had a crop. Over the last two years, she's seen her leaves twist and wither. On the day I visit, her vines look basically normal, even though they're smaller than she'd like. APPLEWHITE: They're all a year behind for sure. They're not as big and full as they could be. 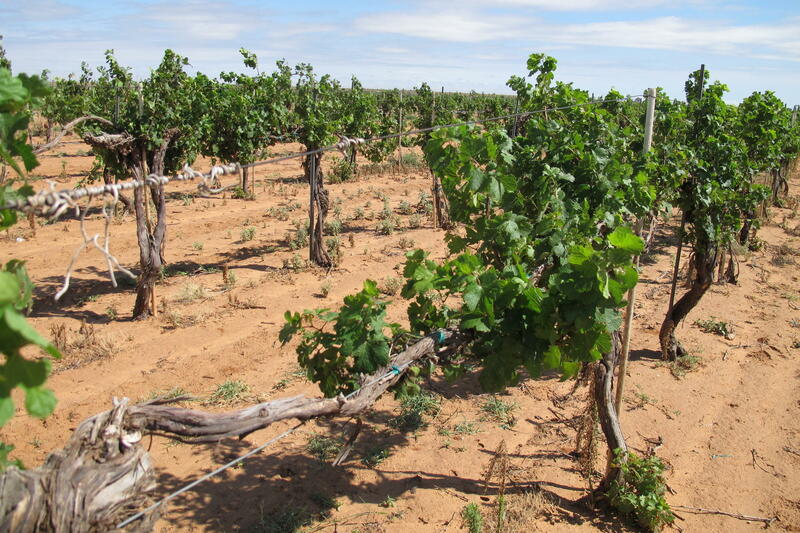 KENNEDY: Actually, many vines across West Texas are stunted. And to understand why, we need to talk about what's happening in all those cotton fields in the area. Right down the road from Applewhite is her neighbor, Dan Smith. Out in his fields, we can see tiny plants just starting to come up from the soil. DAN SMITH: This cotton has been out of the ground for about three weeks. It's 3 weeks old. KENNEDY: Smith is 64. He's lived on this land for almost his entire life. He says the cotton business has gone through huge changes since he first started. SMITH: Back then, you could farm a smaller amount of land and still make a good living. KENNEDY: Today margins are thinner. To make that living, farmers like him have to work much larger patches of land. Smith is growing cotton on about 5,000 acres across multiple counties. And to do it, he says he needs technology, including high-tech weed killers. A few years ago, weeds in the area became resistant to a commonly used herbicide. So the big agricultural companies started pushing new formulations of other existing chemicals. In 2017, companies such as Monsanto and Dow released new versions of these chemicals known as dicamba and 2,4-D. They also started selling cotton seeds that had been modified to resist these herbicides. SMITH: Of course, now we've come out with a dicamba cotton. KENNEDY: Smith uses this new herbicide. He can spray it over the whole field. The weeds die, and the cotton still thrives. The problem is these chemicals are more likely to drift into nearby fields than what they used to use. Nationwide, there are reports that more than a million acres of vulnerable crops have been damaged this year by dicamba, creating tensions between neighbors. Smith says here, they're trying to do better. SMITH: So other places in the country, it may be a really bad situation. But around here, it's very well-managed. KENNEDY: Smith says he's doing everything by the book. The companies have laid out careful instructions for spraying these chemicals. There are a lot of rules. But one of the big ones for preventing drift is to only spray when wind speeds are low. In Texas, the rule is 10 miles an hour. 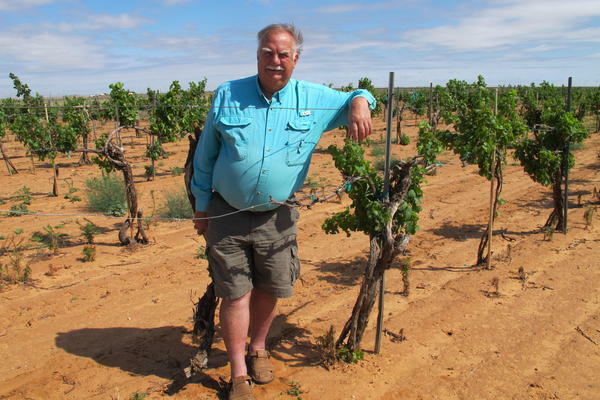 But longtime winemaker Bobby Cox says a mild, 10-mile-an-hour day in West Texas? That's basically a fairytale. KENNEDY: And one of the most sensitive crops to these drifting herbicides is grapes. Cox planted his vines more than 30 years ago, in an area that has become the heart of the Texas wine grape-growing industry. In 2016, everything changed for Cox. His neighbor sprayed the herbicide 2,4-D, and it drifted onto his vineyard. So it was the field right across the street? COX: Oh, yeah, 80 feet away. KENNEDY: Some of the vines still look sick. The leaves are really small and fan out in a strange way. About 20 percent of Cox's vines completely died. As he walks down the long rows, he pauses to pull one out of the ground that can't be saved. COX: This is one that's died. KENNEDY: The next time he's expecting a full crop is 2020, four years after the damage was done. COX: It takes so long to make a crop, and it sticks with you so long. You just lost so much. KENNEDY: Pierre Helwi is a viticulturist for the Texas A&M AgriLife Extension Service. He monitors dozens of vineyards around here and is on the lookout for damage. PIERRE HELWI: And I saw it - I would say that 90, 95 percent of the vineyards there - so it's everywhere. KENNEDY: Drift damage can range from light exposure that doesn't impact the fruit, to total devastation, like Cox. And this area grows 80 percent of the wine grapes in Texas. Cox says he's in the process of working out a settlement with his neighbor who sprayed, which brings us back to the two neighbors we met earlier - Dan Smith, the cotton grower, and Andis Applewhite, whose new vineyard is just up the road. SMITH: Nobody wants to hurt that vineyard. KENNEDY: Smith says he goes to great pains to be careful, even using a different kind of herbicide in the area near Applewhite's vineyard - and adds an extra chemical that's supposed to prevent dicamba drift, to be safe. SMITH: It's an expense I don't have to do, but I feel like I'd better. KENNEDY: Dan Smith is doing his best to be a good neighbor. And Applewhite says other farmers tell her they're also doing their best. But two days after I left, the damage was back. APPLEWHITE: And I noticed on new growth, the deformed leaves. KENNEDY: The vines were suddenly showing signs of new herbicide drift. And her neighboring farmers say they didn't do it. APPLEWHITE: They told me they didn't spray, so I have to believe them. KENNEDY: She filed a complaint with authorities two years ago, but they couldn't pinpoint where the drift came from. This year, she says she won't bother. All she can do is keep working on her vines. Merrit Kennedy, NPR News, Lubbock, Texas. Transcript provided by NPR, Copyright NPR.